A classic example of using hair of the dog to blow away the lingering hangover of Saturday night, Backyard Babies bring a welcome blast of energy-drink buzz to Sunday lunchtime on the Zippo Stage. These sleaze-rocking Swedes are battling against tinny, trebly, windblown acoustics, but they make a decent fist of melodic pop-punk zingers like Dysfunctional Professional and Minus Celsius. 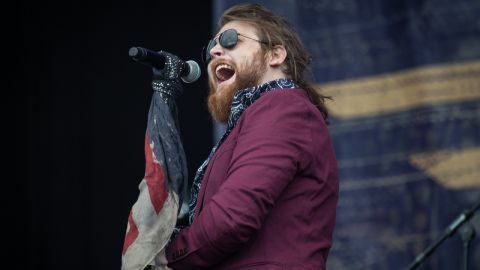 The beard is bushy, the jacket is a ‘grown-up’ burgundy number, he has a long 70s-ish scarf at his waist, and the songs are a rock’n’roll leap from the metalcore of his old band, Asking Alexandria. Danny Worsnop is here to lay down his new matured rock identity, bursting across the stage with a gold micstand draped in a USA flag/scarf. It’s not a perfect performance - there are a few timing wobbles and the sound is on the drum n’ bass-heavy side for much of it - but as a contemporary classic rock prospect, We Are Harlot brim with ability and potential. There’s a hint of Aerosmith in the brooding Someday, The One is a sassy, funky experience, and guitarist Jeff George (grinning like a tanned, American Cheshire Cat) knocks out some delicious licks and crunchy riffs.